If you’re keeping a firm grip on your Classic Plans Magenta customers, fret not as the nations authorized dealers (non-corporate T-Mobile locations) are offering their own sale through the end of the year. This is a Samsung only deal with qualifications that require the line activating or upgrading having unlimited talk and text, and with a $30 data plan. Pretty standard stuff for T-Mobile sales. 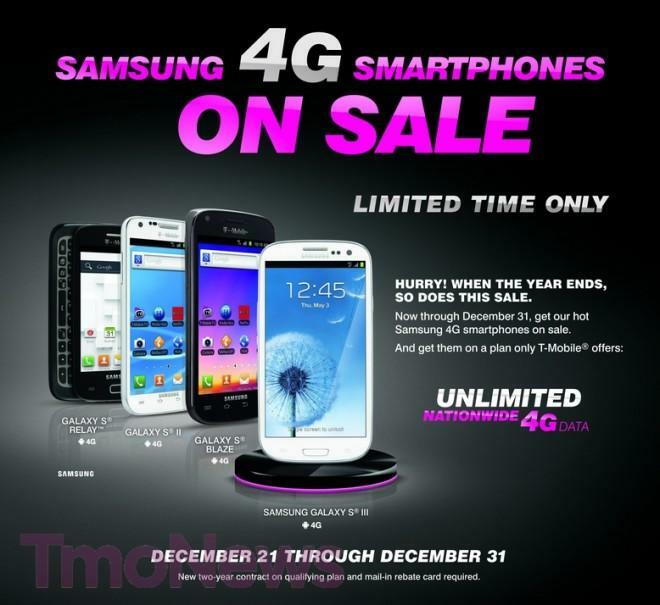 For Value Plan customers, don’t forget T-Mobile’s own sale running through the end of the year on almost all 4G smartphones! Agreed… and it’s not just T-Mo, either. I’ve been ripped off by shady AT&T resellers that also have big AT&T logos plastered all over their store and don’t make it clear that they’re a 3rd party. Why on earth do wireless carriers allow their brands to be devalued like this? Can you imagine KFC letting some random chicken shack use their Colonel Sanders logo? You mean like how KFC franchises and sells to individual owners? If it was a KFC franchisee who sold fried rat meat with a 500% markup on sporks and a bunch of hidden fees that don’t show up on your bill until months later, all of which are pushed on an unsuspecting consumer by unethical, commission-crazed salespeople… then, yeah, it would be JUST LIKE THAT. Were, not was. It’s not a fact, it’s a theory. And I wouldn’t want to eat 20 month old chicken, just saying. What will happen to people on classic plans, who wish to upgrade after dec 31? They stay on them until they try to do an upgrade, then they have to change to value. T-Mobile is performing the ultimate shell game.They are continuing the trend of artificially inflating the costs of cell phones. phones arent any more expensive than other carriers. difference is t-mobile expects you to cover more of the actual cost in exchange for a lower monthly bill. If you rather pay less up front and more monthly then why aren’t you with ATT? Nothing takes place until March 2013, so you can upgrade with no issues and shouldn’t have to change to Value plan. Ahhhhh, ok. Awesome. One less thing to worry about. Thanks JW! Later it was bought out by T-Mobile and the signed changed to just “T-Mobile” and was remodeled. If you go onto the T-Mobile.com website and use the store locator, the actual corporate stores will have the store’s 4-digit code in parenthesis after the actual location name. On the whole, ALWAYS deal with the corporate store, even though there’s fraud there as well but its not as rampant. The stores that you are referring to are called TPR (T-Mobile Premium Retailer). They are indistinguishable from CR locations because they are run exactly the same, with TMO POS, consigned inventory, T-Mobile corporate audits, etc and held to extremely high standards. There is nothing wrong with those stores and in fact, their owners have put up high investment dollars to be in the program with multiple store commitments. As for the negative comments about indirect dealers, for sure there were many issues with fraudulent dealers. T-Mobile has wiped out much of the fraud that was happening by getting much more aggressive in their fraud departments and charging back dealers for their total commissions, which made these dealers not only lose their profit, but also their entire subsidy. 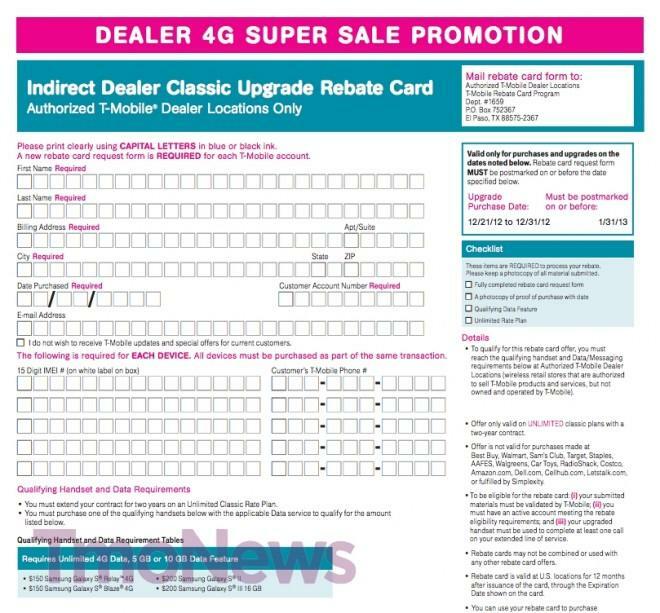 Most of the dealers today that are still writing postpaid activations are doing so honestly and should not be judged wrongly because of the past. Not even as good as Wal Marts regular price. I like my classic plan. 2 family lines with unlimited internet for $90.. I got my S3 for $50 4 days after it was released…. last year S2 free.. I think i will miss my classic if they go all value in 2013.. Zero minutes? No texting? What else does your plan have? Cause I smell bs…. 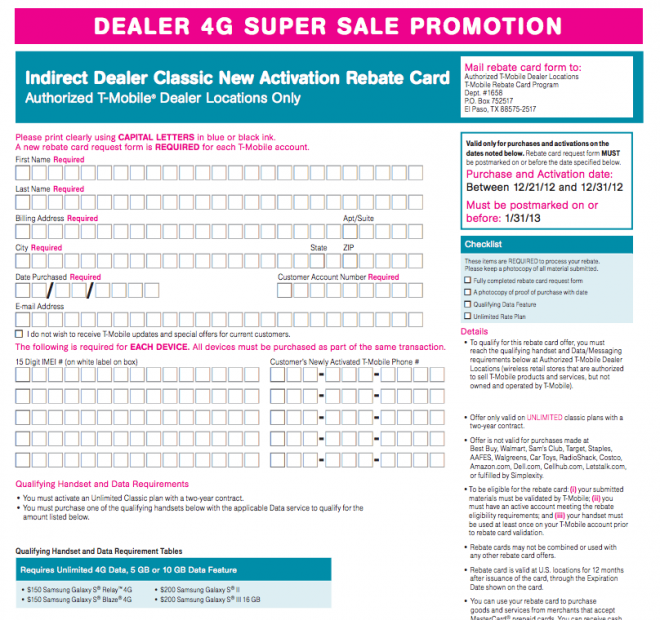 I work for an authorized T-Mobile retailer, and can say that here, at least, we’re not offering the Classic promo. We’re in the business of promoting Value and Prepaid, only. Of course, it’s tough trying to get the concept of interest-free financing into many of the dense minds that we encounter, but we try nonetheless, with smiles on our faces, and patience. Lots and lots of patience. Another employee-of-the-year calling their customers “dense”. what did forrest gump always say? why is a customer “dense” when they clearly understand that you’re trying to scam them? tmobile has plenty of other options on prepaid that are the same or cheaper than the value plan, no two year contract required. Besides, tmobile’s EIP prices at inflated MSRP are usually $200 more than the same phone elsewhere, for example, samsung galaxy s2 is only $300 at walmart and other places, prepaid and no contract required. So the tmobile employee/authorizedretailer gets $200 commission for each contract they sign, and don’t have to give a phone subsidy… why is the customer “dense” again? You are a moron to believe that drivel. Sorry, new here. What’s the difference between a classic plan and a value plan?